I don't need much of an excuse to don festive gear. In fact, whatever the season I'll fully embrace it but Christmas is extra special isn't it? My winter wardrobe consists of numerous Christmas jumpers and while you might think it extravagant, I have a number that are older than my children so I think they're a wise investment if you buy right. 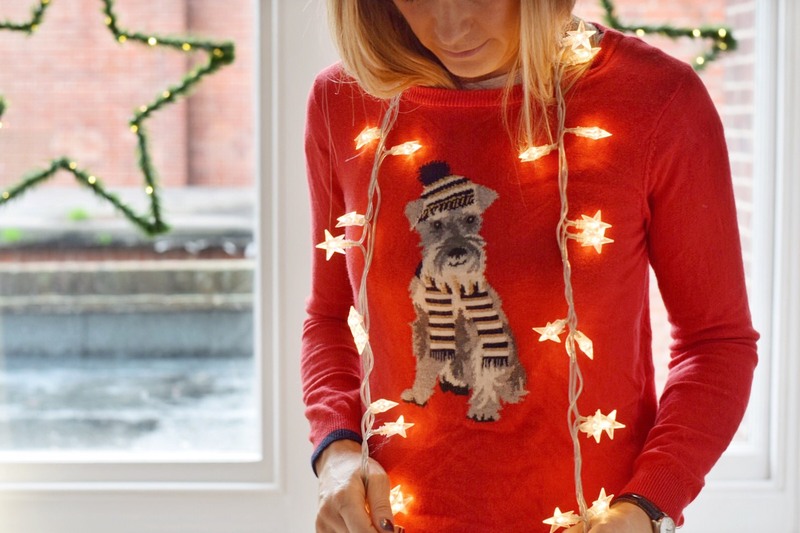 I've had this Joules miranda red terrier jumper for a few months now and love how light it is. The colour is stunning and the knit is such lovely quality that I can see myself wearing it for years to come. It's great for layering and won't leave you overheating. I've gone for an XS and that's about right for me in Joules. Next up is a Boden breton. I love that Mrs Claus has red glasses like mine so couldn't resist. 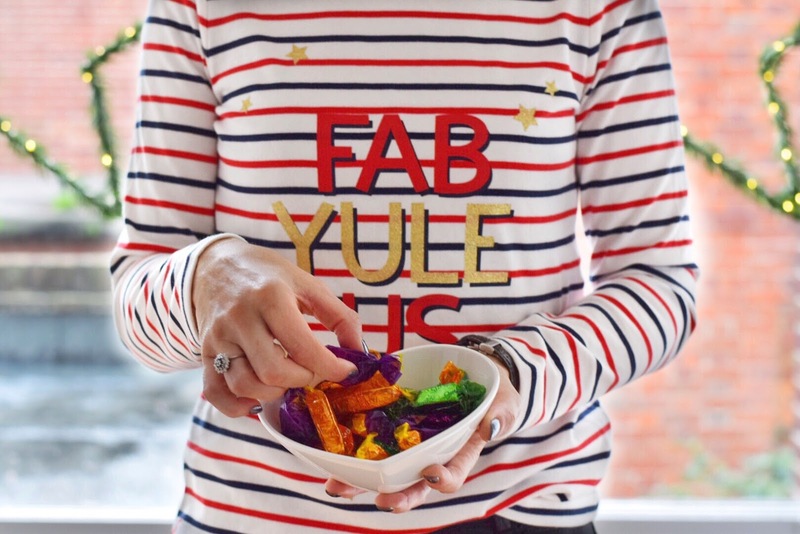 It's the lightest fabric of all of the tops and jumpers in this feature and has enough stretch to mean it will be comfortable when I'm eating all those mince pies, but is smart too. It's true to size and, as I like things fitted, I've gone for an 8. Next up is a brand I fell in love with a few years ago and every time I wear one of their jumpers someone comments and asks me where it's from. Mint Velvet's jumpers have a distinctive style and shape (loose and v-neck) which I love so this ink star sweat is a little different and a bit out of my comfort zone but I absolutely love it. Technically, not a Christmas jumper but the stars make it subtly festive and mean I can keep wearing it as long as the weather is chilly (I have a thing for stars). It's nicely fitted on the sleeves but loose around the body and the quality of the fabric makes it cosy and smart. Back to another Breton, this time from Joules Harbour collection. It's fun slogan puts a smile on my face and I really like the mixed navy and red stripe but they have around a dozen different designs ranging from small scattered stars to different slogans and the colour changing star featured further on in this post. I guess, what I'm trying to say is there is a design for everyone! They're a cosy thicker fabric and roomy enough so size down if you like things fitted. The next two are from Boden. 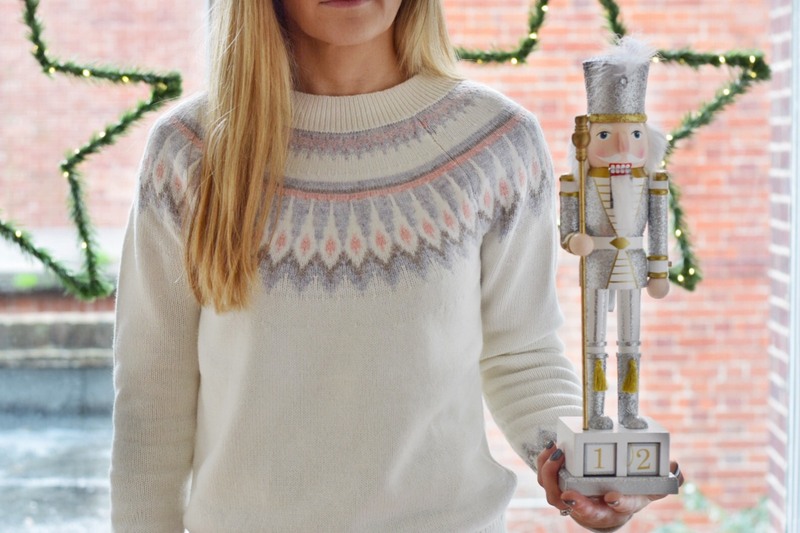 It's rude not to include a cosy fair isle knit and this one is so soft you won't want to take it off. Now the weather has turned it's perfect for when you're out and about. The colours are really soft so you'll love this is you prefer and more subtle look. 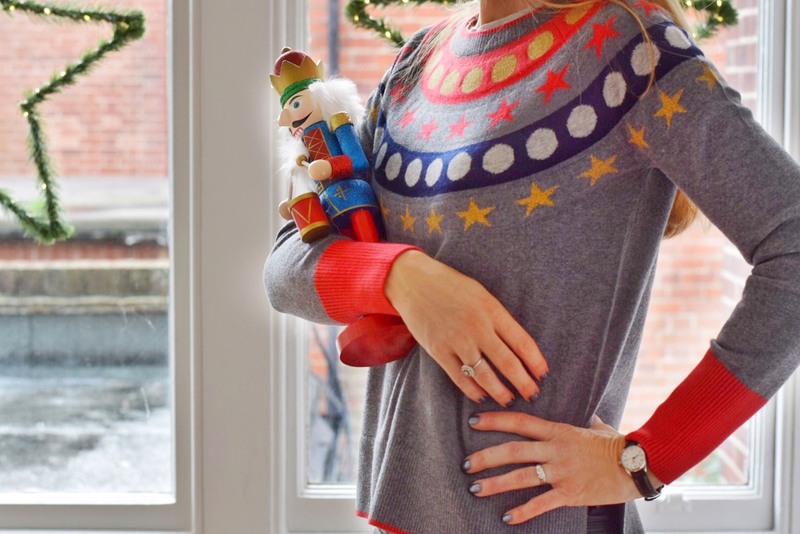 If you want to come marching into Christmas like me though, you will adore this romy one with it's merino will blend and loose cut around the waist (perfect for those feast-filled days!). 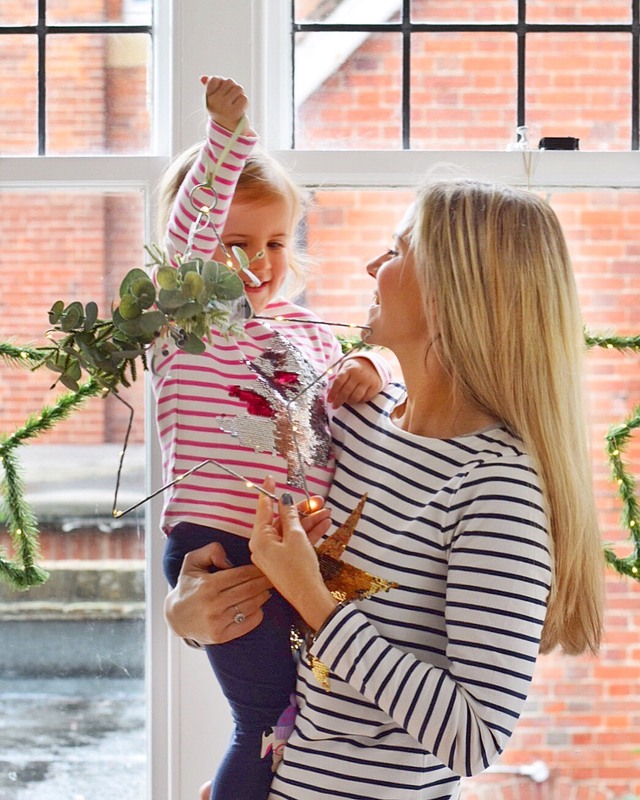 I'm not used to twinning as we're a male dominated household (even the dog is a boy), so I am trying to seize the opportunities whenever I can and these Harbour luxe tops are so gorgeous! My luxe cream star jersey and Holly's pink stripe tree jersey have reversible sequins that make them even more fun. 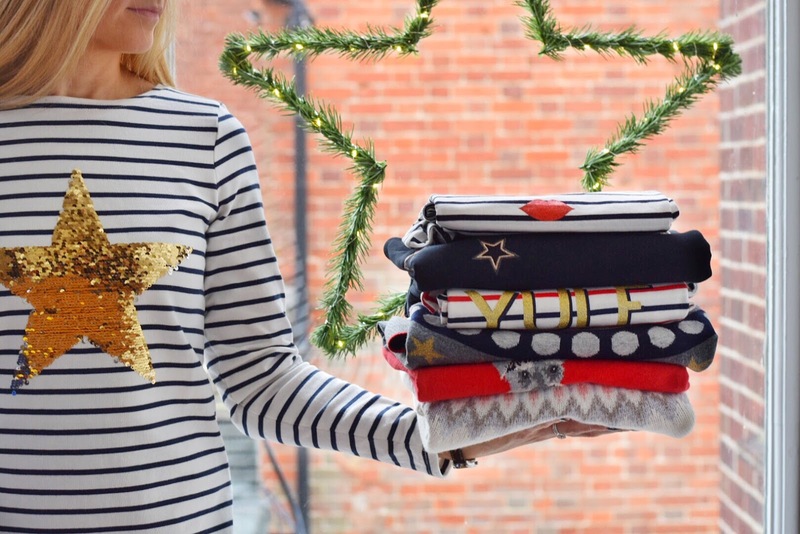 I hope you like my round-up of favourites and found some you're tempted by or that, whatever festive tops you're wearing this Christmas they put a smile on your face. Now, if I could just decide which one to wear to work for Christmas jumper day on 14th!